Documentation is in progress. If something is missing, kindly check back soon. In order to show comment count on button you will need to have DCL Pro version. If you have the pro version already go on! You will need to enter your Disqus API key first. For that register an app with Disqus. Click here to create new app. Just fill the form and make sure you enter the correct website (where you have installed DCL Pro) on the website text box. After creating the app, go to this page and get your API key, that is your Public Key. ( You will have to assign a trusted domain, which should be our website). 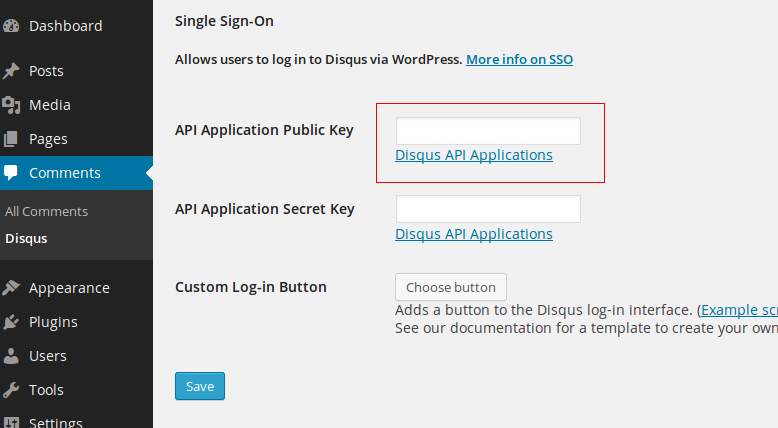 Just copy and paste the public key to the API Application Public Key field in Disqus settings page on your website. Now you can enable Comment Count on Button option on your DCL settings. If you have added a valid API key, it will start showing comments count. Note: It will work only if you are using On Click option to load comments. If you ever need help with DCL, you are encouraged to use our contact page where you can always get your support questions answered. If you'd like to report a bug or have ideas for how to improve the plugin, please mention that in your mail.